Oh My...I'm printing this one out! Just sounds delicious, and I have the ripe peaches on hand!! Thanks! Oh yes, this looks like a winner! I'm into the canning mode and this one is a must do. Thanks - you continue to inspire me! Speaking of oranges, when i lived in Florida the prices seemed higher than the rest of the country. So i could never fiqure that one out folks!. Sorry i got off topic here, this one would be perfect for a Florida drink right about now. Everyone have a great weekend. Richard from the Amish community of Lebanon,Pa. It all seems so do-able the way you present it. Ok, I'm heading for our farmer's market to pick up supplies. 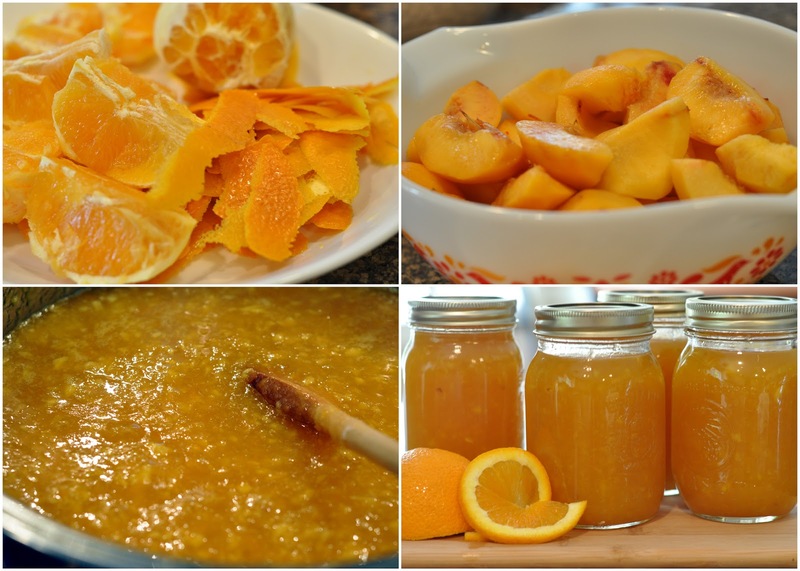 I make a version of this but call it Peach Marmalade. It's my favourite spread. The flavour combination of peaches and orange rind can't be beat. That looks so delicious. My husband just loves peach jam, but I'm sure he will love this too. Oh, I am drooling! I use to make peach preserves years (and years) ago. I also love orange marmalade, but never thought to combine them. What a great recipe. Sounds heavenly! I will have to try this. Do you water bath them at all?? This sounds so delicious I think I will try it. Wish I had access to fresh peaches right now. Call me stupid, but in step #3 do you want me to blend the oranges and the thin strips of orange rind together? I know you want me to get rid of the white part. This sounds awesome! I love anything peach! I'm co-hosting Canning Week on my blog and invite you to come by and link up your recipe! We're having a recipe contest and canning related giveaways all week. I hope you stop by! SO, if I don't freeze this, do I need to put them in the canner to process them?? In answer to some questions... no, the jars do not need a water bath or separate canning process ... the hot jars and lids, with the hot jam seal at room temp as they cool. Store in cool place after that. If you notice that a jar did not seal (lid stays popped up), refrigerate and use first. Mimzy.. sorry, I did not see your question earlier...yes.. put the thin peeled rind into the blender, add the peeled orange segmments and blend well. How many pints does this make per batch? As stated in the recipe it makes 8 cups ...which would be 4 pints I believe. Anneliese, I made two batches of this today and it is wonderful! Thank you so much! Mimzy - I'm happy to hear that! This is almost the same as my grandmother's recipe, which she called Peach Conserve. The recipe is the same, except for the addition of halved maraschino cherries and chopped walnuts. With or without these additions, it's delicious!